I have always admired and enjoyed found poetry–the process of uncovering new art from existing text feels like a celebration of not only creating the work, but of the original work itself. 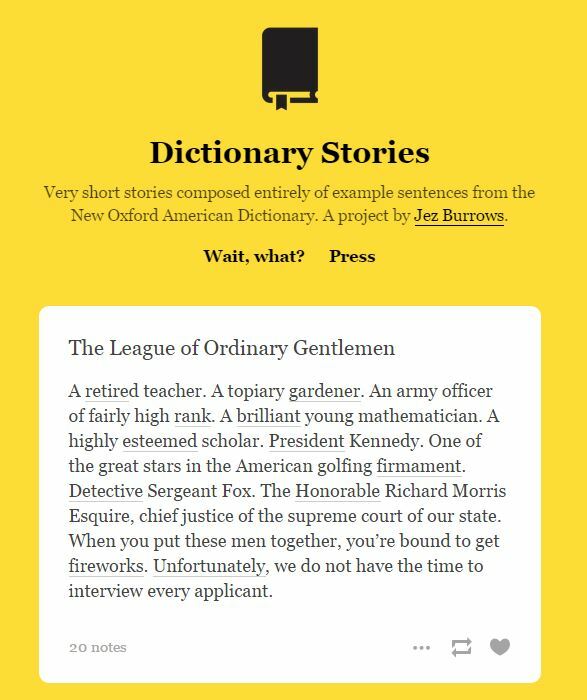 Jez Burrows launched a project this year entitled Dictionary Stories, where he created “[v]ery short stories composed entirely of example sentences from the New Oxford American Dictionary.” This combination of found flash fiction sparked my interest immediately and held it strong with perfectly re-purposed prose, cleverly crafted in little vignettes. Of course, having worked with many found prompts in National Poetry Month projects sponsored by the Found Poetry Review, I had to take a stab at finding my own example sentences. For more found poetry prompts, check out their weekly prompts page here. I added a little twist to the prompt and used the key words from the last stanza of Emily Dickinson’s “I felt a Funeral, in my Brain” as words from which to gather example sentences. The example sentences took Dickinson’s words on an unexpected turn. I referenced the online version of Oxford Dictionaries, which includes several example sentences you can choose from. 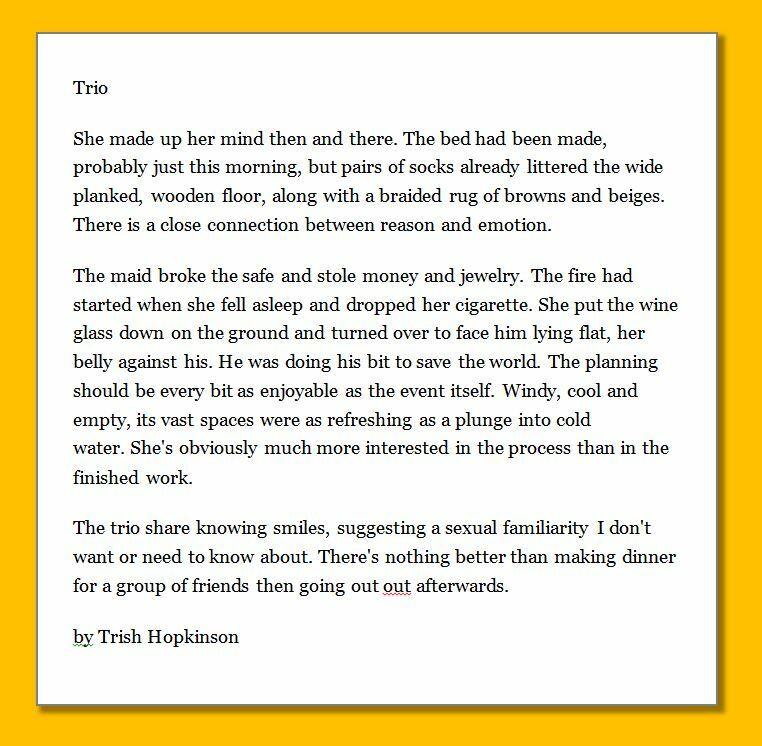 Here’s my found dictionary story… entitled “Trio.” Enjoy! Katherine Connor Martin, head of U.S. dictionaries at Oxford University Press, told me that they don’t make up any of these sentences for the dictionary—they all come from existing work, which makes the piecing of them together to create new stories kind of poetic. The New Oxford American Dictionary uses the Oxford English Corpus, which is a collection of academic works and newspaper articles, but also some unedited content that appears on the Internet.